Very few Milwaukee-area venues hold as much historical prestige as this month’s featured venue, Turner Hall Ballroom. Built in 1882, Turner Hall Ballroom has three historical designations, including National Landmark, Local Historical Landmark, and a listing on the National Registry of Historic Places. Its storied past only lends to its distinguished charm, artistic sensibilities and culture-rich beauty; making it the perfect location for weddings, galas and social celebrations. Turner Hall Ballroom’s beginnings as a showplace for panoramic painters and German immigrant artists helped pave the way for the Milwaukee art scene throughout the early 1900s. And its artist roots have never left, as this two-story, 7,000+ square foot ballroom still hosts live music from prominent touring performers year round. Located in the heart of downtown Milwaukee and just steps from the Riverwalk and many prominent hotels, Turner Hall Ballroom provides a great central location. A private event in this captivating space offers plenty of space for up to 350 guests, unique customization options and special amenities. You’ll be in awe of its distinct characteristics and exceptionally high ceilings. If you’re looking to impress your guests within a uniquely intimate setting, Turner Hall Ballroom is the perfect place. Your rental includes access to the 2nd-floor Ballroom level, as well as the balcony level that overlooks the Ballroom and the happenings below. 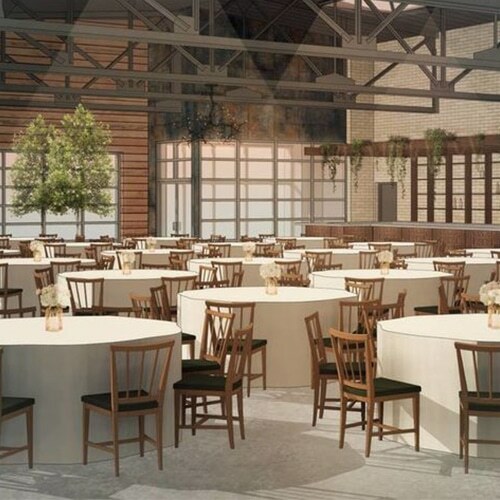 We have the pleasure of being a preferred caterer at this location with plenty of insight into Turner Hall’s unique layout and design, ensuring a smooth flow and impeccable service for any event type. Your rental fee includes an on-site coordinator to help facilitate vendor delivery and pick up and day-of set up. As a preferred caterer for Turner Hall, you’ll find us offering fresh insight into the creation of your unique wedding menu, as well answering any questions you might have about planning your next event at this gorgeous location. For more information about Turner Hall Ballroom, reach out to Ann Birkinbine, Rental Coordinator, at 414.286.6164 or by email at abirkinbine@pabsttheater.org. Be sure to let her know you discovered more about this awesome space from Saz’s!